For a while here I've been publishing page after page of chords, which is something I hardly ever used to do. It's probably time for an explanation. For many players "harmonic vocabulary" is just "which chords you know". The chords all fit into a system, which is usually some version of functional tonal harmony derived from college jazz programmes. This `background' consists of a collection of chord types based on the roles of seventh chords harmonized out of the major scale such as dominant, subdominant, tonic and so on, along with borrowed chords like VI7. Against this background most of your job is to learn two things. 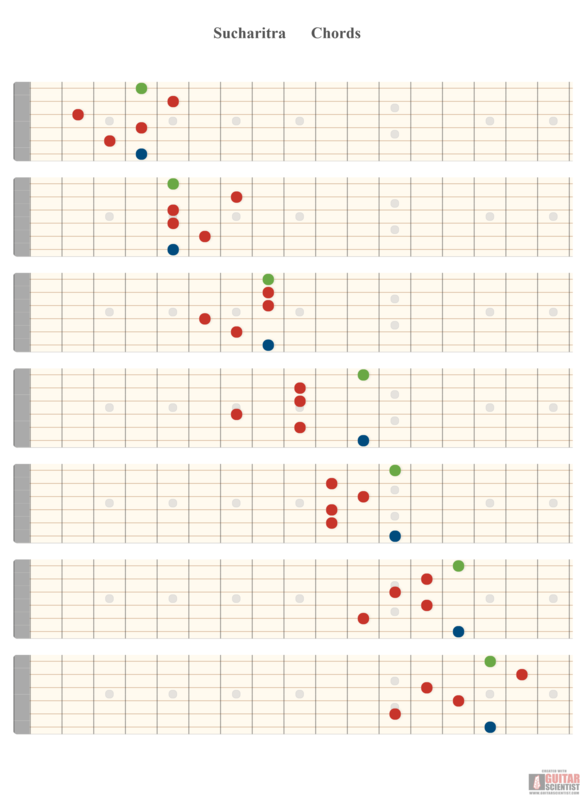 First, more ways to play each chord type -- voicings that sound pretty or open or crunchy or whatever. Second, chord substitutions, which are really just the same as the first thing: voicings that you learned as one chord type but that can also pass for another. There is also a third thing, which is entire `sequence substitions'; the most famous of these is the Coltrane changes that substitute a canned sequence of seven chords for a ii-V-I. Of course, the ii-V-I, the i-VI-ii-V and all the rest are cliches that are part of that shared harmonic background. Conrad Cork's book The New Guide to Harmony with LEGO Bricks is a brilliant catalogue of these; if you have the slightest interest in playing "Great American Songbook"-type tunes you should seek it out. Now, although I've tinkered with that repertoire in the past I never felt "at home" in it. Jazz wasn't my first love; classical modernism was. I'm an improvisor, which meant jazz was a natural place to go but I was always a visitor at best, an impostor at worst. I love (some of) it but it's not really my music. Meanwhile, modernism can be tough on an improviser. In particular, serialism seems to me to be truly a composer's method. To write good serial music requires careful crafting of every bar. That's because, in the absence of shorthand gestures like ii-V-Is, you have to help the listener out by building in lots of musical information for them to catch hold of. Otherwise the results just sounds random, even to a well-disposed listener who is trying hard to make sense of things. A clue about how to proceed came to me from Barry Harris's "sixth diminished thing". I wrote a post here about it but at the time I hadn't really understood it in all its ramifications -- Alan Kingstone's book is still the place to get info on this if you're interested. The point for me was that Harris's idea isn't about learning a new chord or two, it's about learning a whole new group of chords that have their own internal logic. The chords themselves, in this case, are nothing special - you already know them. The innovation is in the structure the chords live in, which gives them new meaning. Now, Harris's particular structure wan't all that interesting to me in the long run because it's still tightly bound to conventional jazz harmony. That makes perfect sense, that's his world. But it suggested to me that whole new harmonic structures might be far more fruitful than individual chords. For example, here's a recent post about chords from the Sucharitra scale. I've been playing these a lot over the last month or so and I really enjoy them. But I'm not playing individual chords from these sheets -- I'm seeing them as connected sequences of chords that contain all kinds of internal pushes and pulls from which you can make music outside any reference to the tonal system. One way I like to do this is the way I first encountered Harris's idea -- by harmonizing a chord through the scale. And this is precisely how we end up with IΔ iim7 iiim7 IVΔ V7 vim7 vii°, the foundation of tonal harmony as understood by most people today (historically this is a bit off, but whatever). The point is that you get a whole different one of these, with a bunch of different chord functions that you have to use your ear to figure out. To my ears this collection of chords does have kind of an "A minor or C major" feel to it overall, but the absence of anything like a dominant function means the chords unfold according to their own logic. I keep finding new voice-leading ideas in this particular sequence but really any other sequence will do the same job if you're persistent with training your ear to hear what it's trying to tell you. I'm not using this material to find hip reharms for standards. In fact, part of the message all of them are trying to convey, at least to me, is that there's a way out of "college jazz harmony" for those who want that while still remaining improvisers. The combination with coscales also makes it easy to play freely 12-tone music in this way (I may say more about this in a future post). So, anyway, that's why I keep posting these pages of chords here, and will continue to do so for a while yet.